After A Culture of Growth, I turned back to my original idea of studying the history of the Industrial Revolution. I’ve picked up the book A Brief History of How the Industrial Revolution Changed the World, by Thomas Crump. The first story of the Industrial Revolution is that of the steam engine. When you think “steam engine”, you may think of James Watt, but the first steam engine was actually created by Thomas Newcomen, in 1712. The Newcomen engine was not an engine the way we think of engines today: as a kind of motor, turning a shaft or crank. It was a pump. And its original use was to pump water out of mines. The British iron industry at the time needed a new fuel. Ironmaking requires intense heat and therefore fire. For a long time this was provided by wood (actually by charcoal—but that’s a story for another post). But Britain was rapidly depleting its forests. So, they needed a new fuel, and they turned to coal, which they had plenty of. The problem was that once you go down far enough in a mine, you hit groundwater, and you need to pump it out. In copper or tin mines, the pump was powered by horses. But coal was needed in vaster quantities, requiring larger volumes of water to be pumped. A better source of motive power was needed. 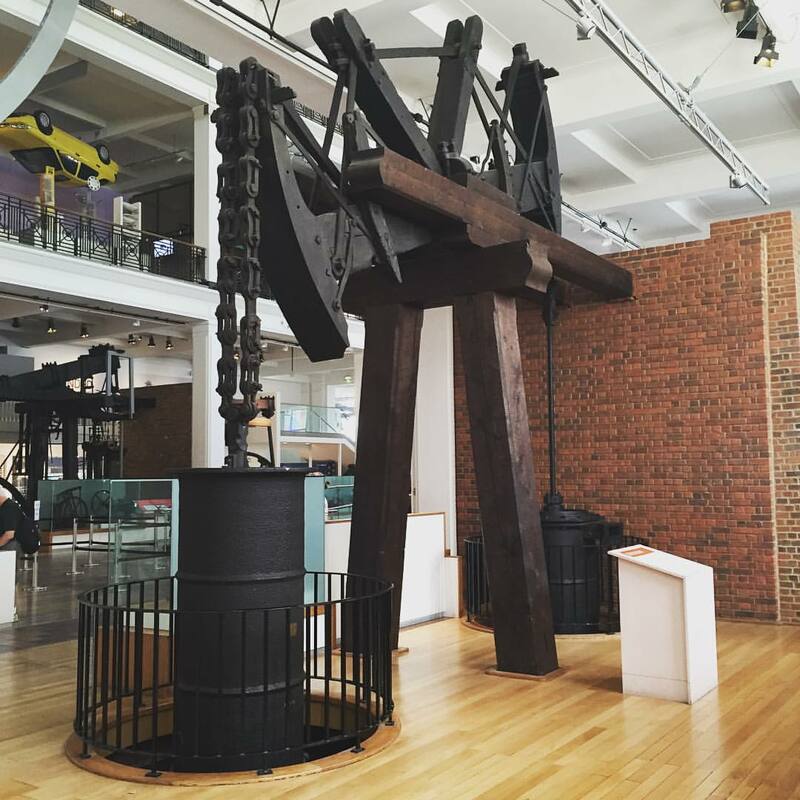 Enter the Newcomen engine—a steam engine, although it was also known as an atmospheric engine or a “fire engine”. The engine worked on an established scientific principle that had been demonstrated to the Royal Society in the previous century: a piston, filled with steam, will pull with substantial force when the steam is condensed by cooling it. Steam from the boiler is let into the piston, letting the chain attached to the pump sink down. Cold water is briefly sprayed on the piston, cooling and condensing the steam. This creates a vacuum, which pulls the chain back up. You can see it in action on Wikipedia. Reading this story, I was struck by how much Newcomen was hampered by not having, well, the Industrial Revolution yet. There was no good transportation, so machines had to be built locally, out of local parts and materials, by local craftsmen. The engines were big and heavy. Also the fuel had to be local, because there was no good way to transport the fuel itself. There was no good way to communicate, so innovations that local engineers made didn’t spread and were reinvented by others decades later. Materials science was in its infancy, so they couldn’t use the best metals. Et cetera. Looking at it this way, it’s clear why progress is exponential: every part of it strengthens every other part. Not only is human progress an interconnected whole, it’s a self-reinforcing, self-accelerating whole. Conversely, it’s a little brilliant how the whole thing got started. The engine pumped water out of coal mines. It was powered by coal from the mine itself! (And apparently it was small bits of coal from the head of the mine, which weren’t very useful anyway, so it wasn’t a waste.) That’s how they avoided the need for railroads to carry fuel (powered by advanced versions of the steam engine that wouldn’t be invented for decades). It’s like the single-celled prokaryote of the Industrial Revolution, that eventually evolved into the multi-celled organism of today’s global economy.